When it comes to choosing a WordPress theme, I’m having some difficulty finding one that fits with the expansive “theme” of my content. Since my blog is not strictly a food blog I do not want a layout that is too image heavy, still I would like to include a graphic with each blog post. 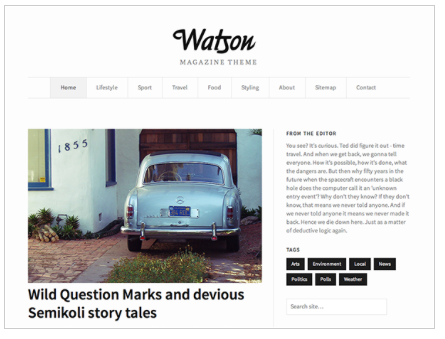 In searching for a versatile theme that lends to long-form content, as well as shorter blurbs and photography I selected the below themes from WordPress.com. Watson is clean, elegant and professional, and would lend itself nicely to the sort of long form content I intend to include (ie article reviews). I like how it is clearly broken up into different categories making the site easy to navigate. My only reservation here is that it is not necessarily as fun and flirty as some of the other themes and because my demographic is young women I worry it won’t immediately grab the readers’ attention. 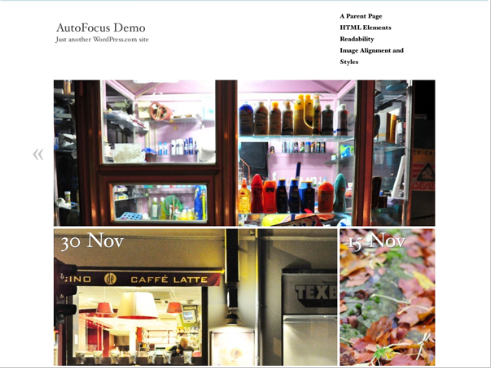 I chose AutoFocus because it is the same theme used by Green Kitchen Stories which I mentioned in my previous post is my favorite blog in terms of graphic design. I myself am a picture person, and I think when it comes to a lifestyle blog about food and fitness pictures are essential. I also like how readers can easily find the link to Instagram, Twitter, and the “About me page” in the top left corner. This entry was posted in Assignment on 29 January 2014 by Annie Meadows. “I Miss Hotdogs” is a food and lifestyle blog intended to inspire girls to enjoy healthier, more active, and energy-filled days. Content will range from fitness tips, recipes, occasional app, article and product reviews, inspirational photos and quotes, and personal content as I strive to achieve a much needed balance in my own life. While recipes will be primarily vegan and gluten free–it is intended to be a fun, tasty and welcoming space for carnivores and omnivores alike, as I believe that what you put in your mouth is your own business! This is just my journey and for the purpose of full disclosure, I really miss hotdogs. The three sites I chose were Thug Kitchen, Green Kitchen Stories, and Fitnika. Fitnika is the Tumblr of a 19 year old girl who follows a gluten-free vegan diet and is an avid weight lifter. The Tumblr documents her nearly 40lb weight loss which she achieved through healthy eating and exercise alone. It is a highly visual site filled with motivational pictures, quotes, and personalized content. I like to look at it when I don’t feel in the mood to go to the gym :). While this site is much more heavily weighted towards fitness, the aspects I appreciate and intend to include in my blog are motivational images, personal anecdotes, and an overall focus on healthy living. Green Kitchen Stories takes the reader inside the kitchen of a young family as they prepare healthy vegetarian food and share bits and pieces of their daily life. The blog was named Best Special Diets Blog by Saveur.com and in my opinion is by far the strongest of the three in terms of graphic design and photography. One aspect of the blog I really like is that the couple remains very active on Instagram which gives viewers a look at their lives outside the kitchen. I intend to use Instagram as an integral way to engage my readers between blog posts. Thug Kitchen is my personal favorite food blog because of its sheer entertainment value. The posts are simple and the author does an excellent job of using humor to educate readers on healthy eating. Many readers don’t even realize the recipes featured on Thug Kitchen are entirely plant-based. This is the same sort of tone I hope to capture in my blog. Above all else, I want to keep the reader inspired, motivated and entertained.